The Programme for International Student Assessment (PISA) is a project of the Organisation for Economic Co-operation and Development (OECD) designed to provide policy-oriented international indicators of the skills and knowledge of 15-year-old students. In this book, Eduardo Andere suggests that the �lending power� of international studies such as PISA is limited. PISA might be a good instrument for measuring and comparing some educational inputs and outputs but, suggests Andere, this is not enough for translation across contexts. He finds that PISA is not a very powerful instrument for explaining causal relationships in educational achievement, nor for making claims about models or directions of education systems across the world. 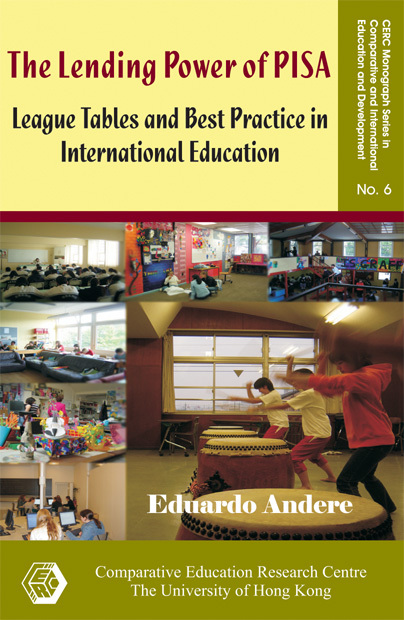 Basing his arguments on a qualitative study in 19 countries around the world and on a review of the centralization/decentralization and policy borrowing/lending literatures, Andere presents some of the conflicting evidence about the different meanings of education policies and ideas in different contexts. He suggests that it is problematic to compare policies, processes and practices across the different contexts of school education, thus rendering transferability across educational jurisdictions even more challenging. To understand the reasons behind performance or underperformance in school education, we have to construct, he concludes, a coherent narrative of a particular school and of the model of education in which the school is embedded. Eduardo Andere is a part-time researcher at the Mexican Autonomous Institute of Technology (ITAM). He is a lecturer at or adviser to universities and schools in Mexico, and an adviser to the Mexican government. He is a member of the Mexican National Researcher System, and holds a PhD in Political Science from Boston College and Masters degrees in Economics and Public Administration from Boston University and Harvard University respectively. He received his Law degree from Universidad Iberoamericana in Mexico City. He is the author of four books about education policy, world schooling and school education in Mexico, and has published papers in both Mexican and international journals. He is an op-ed writer and columnist. Chapter 1: A Global Model of Education?